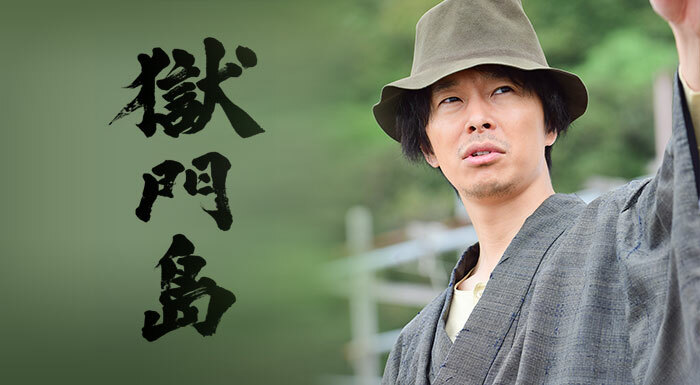 Gokumontou SP (19 Nov. 2016, NHK) is a two hour long special based on a Kindaichi Kosuke mystery by Yokomizu Seishi. Hasegawa Hiroki plays the famous detective Kindaichi. The setting is 1946, on a fictional island called Gokumon-tou, located in the Seto Inland Sea. Kindaichi intended to convalesce in Gokumontou, at the invitation of his war buddy Kitou Chimata, the successor son of the island's powerful clan called the Kitou Family. However, Kindaichi arrived alone, bringing bad news of Chimata's demise. He is introduced to Chimata's three remaining sisters, who are pretty but act very childish and immature. He also meets Sanae (Naka Riisa), the lovely cousin of Chimata. He learns that the family's patriarch has died, and that they are waiting for Sanae's brother Hitoshi to come home from the war. Meanwhile, the affairs of the house are entrusted to the three village elders, Head Priest Ryonen (Okuda Eiji), Village Mayor Araki (Sugawara Daikichi), and Chinese medicine practitioner, Koan-Sensei (Ayata Toshiki). However, the truth is, Kindaichi is not on the island to recuperate. Before Chimata died, he uttered the words: "My sisters will be killed!" Sure enough, as the three sisters are killed off one by one in horrible bizarre manners, Kindaichi tries desperately to find the culprit and in the process, gets to encounter family intrigues, secrets, island mentality and discrimination, and eccentricities, amidst the backdrop of a turbulent post-war era. Thanks for the subs and thanks to VampireXxX for the terrific RAW. Thank you very much for subbing this SP, really appreciated your hard work. Taking. Thank you for this SP!!! Hi dear. Thankyou so much for subbing this, really appreciate your hardworks. By the way, i will retranslate your sub to Indonesian.